Last week, entertainment news site Deadline came under fire after posting an article penned by TV editor Nellie Andreeva. 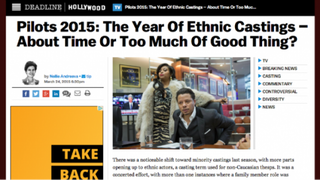 Andreeva’s article, titled, “Pilots 2015: The Year of Ethnic Castings—About Time or Too Much of Good Thing?” was basically a pool of white tears and whining about how there are just too many nonwhite actors taking jobs away from white people in Hollywood. Sure, Andreeva appreciates diversity, but “whoa,” Nellie said; it was overkill. Andreeva’s article received backlash from people online and from people in Hollywood, like Shonda Rhimes, who was ready to take off her earrings. “I don’t believe you can can make an unwise story disappear and pretend it didn’t happen. I observed how Amy Pascal raced around with knee-jerk apologies to anyone who’d listen, after those stolen Sony e-mails surfaced. Her actions felt like panicked damage control to me; we decided to face the consequences and take our lumps. We did that in the comment tail following that story, where over 700 readers teed off on us,” Fleming said. “That original headline does not reflect the collective sensibility here at Deadline. The only appropriate way to view racial diversity in casting is to see it as a wonderful thing, and to hope that Hollywood continues to make room for people of color. The missteps were dealt with internally; we will do our best to make sure that kind of insensitivity doesn’t surface again here. As co-editors in chief, Nellie and I apologize deeply and sincerely to those who’ve been hurt by this. There is no excuse. It is important to us that Deadline readers know we understand why you felt betrayed, and that our hearts are heavy with regret. We will move forward determined to do better,” Fleming continued. So basically, “We’re sorry, but we got all of those page views last week. Mission accomplished.” If they were truly sorry, someone would have stopped the post before it even went live on their website. But trolls are gonna troll.